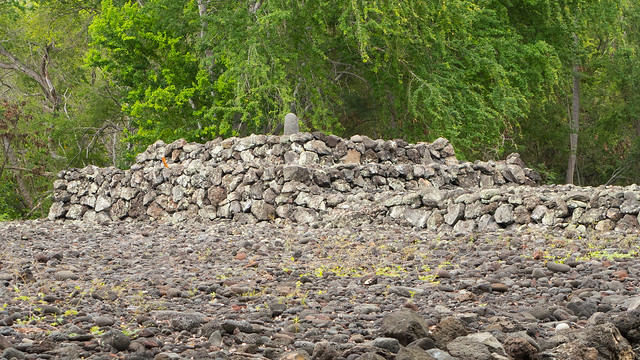 Adjoining one side of the Square was the great Morai, where there stood a kind of steeple ‘anu’u that ran up to the height of 60 or 70 feet, it was in square form, narrowing gradually towards the top where it was square and flat; it is built of very slight twigs & laths, placed horizontally and closely, and each lath hung with narrow pieces of white Cloth…. next to this was a House occupied by the Priests, where they performed their religious ceremonies and the whole was enclosed by a high railing on which in many parts were stuck Sculls [sic.] of those people, who had fallen victims to the Wrath of their Deity. There is a dark side to the past of almost every human culture, and that of Hawaii is no exception. Today I looked at the remains of a heiau, a temple where humans were sacrificed to appease the gods. The influence of the new haole religion finally put a stop to all that; one sacrifice some 1800 years earlier was enough to get the job done. 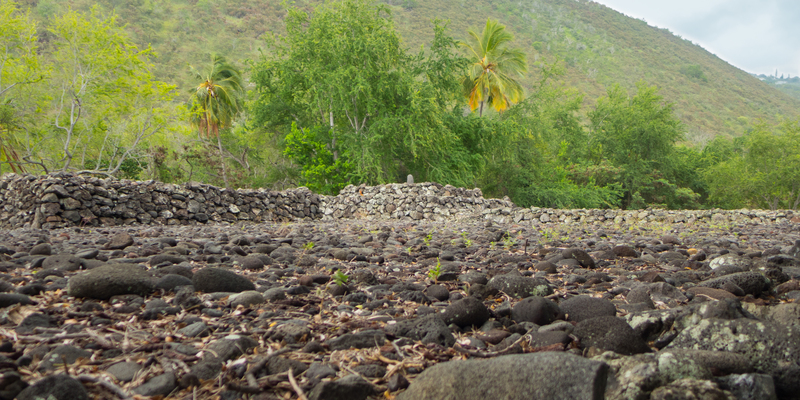 A much more pleasant to contemplate, if modest, Hawaiian cultural encounter was one I had with a gentleman named Sam just a few miles north of the Hikiau Heiau site. He showed up with his ukulele at the Keahou Beach park south of Kailua-Kona, Hawaii. 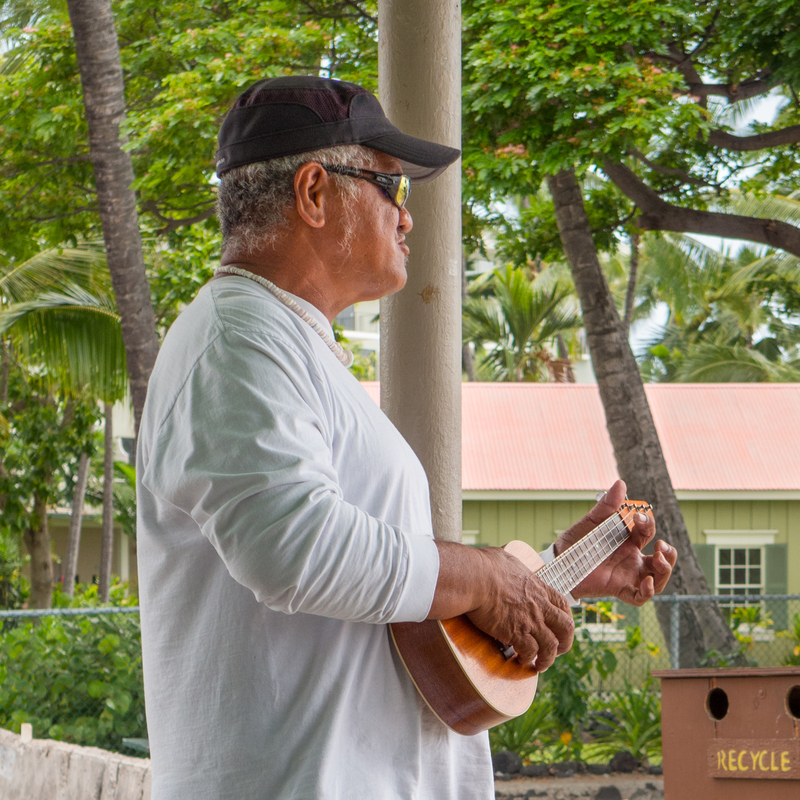 Sam played and sang away under the pavilion at the park with no tip jar, hat, or open instrument case in sight. Sure, he probably accepts the donations that surely come his way from tourists, and that may even be a motivation for him to be there. But he really did seem to be doing this for the pure pleasure of it, too. When he saw that I was filming him, there was a noticeable extra bit of enthusiasm in his voice. He happily gave permission for this video to be posted, and told me the song is Wahine ’Ilikea by Dennis Kamehama. When we left, Sam was sitting on one of the picnic tables under the pavilion so that the little Asian boy next to him could watch him play and get in the picture being taken by his parents. Maybe it’s tourist kitsch, a diluted echo of Hawaiian culture infused with California surfer and pandering to the Hollywood view of the Islands. But I’d say it beats human sacrifice any day.